Purevision Bausch & Lomb PureVision ™ contact lenses are made from a unique material that allows natural oxygen to pass through, allowing your eyes to see rich contrast and detail while still remaining exceptionally comfortable. These PureVision monthly wear contacts are also approved 30 day continuous wear. If there is one thing you should know about your eyes, it’s that it needs oxygen to stay healthy. Bausch & Lomb PureVision lenses made of AerGel which provides oxygen to your eyes as it repels dirt and debris. It’s so comfortable that it feels like you’re not wearing contacts at all! The round edges guarantees a comfortable fit that will last a long time. Get your Purvision contacts now only here at cococontacts.com. *What is AerGel? AerGel is a unique silicone hydrogel material specifically designed to allow the natural flow of oxygen to reach your eyes. It offers remarkable elasticity and with the help of Performa surface process, actually resists dirt and debris – the 2 common causes of discomfort and irritation. Bausch & Lomb PureVision® contact lenses are the first lenses made using our unique AerGel™ material, delivering exceptional vision, with outstanding comfort and health. Their unique optical design makes them the only lens that successfully reduces spherical aberration - a natural condition that causes objects to appear blurred or hazy - and the special rounded edge profile ensures a comfortable fit on your eye. With PureVision lenses you'll always experience life with visual clarity and comfort that fits the demands of your lifestyle. 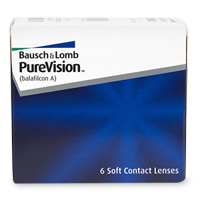 PureVision® contact lenses by Bausch & Lomb. Versatile monthly disposable lenses that are designed for daily or extended wear. Each box contains 6 disposable soft contacts. Your eyes need oxygen to stay healthy. Bausch & Lomb PureVision® contact lenses are the first lenses made using the unique AerGel™* material, which provides the natural level of oxygen to your eyes. In fact, AerGel™ provides as much oxygen as if you were wearing no lens at all! Contact lenses stay comfortable all day! The Bausch & Lomb Performa™ surface process hels to repel dirt and debris before it can accumulate and cloud your vision. The Performa process also helps to prevent protein and lipid build up - two major causes of contact lens discomfort. PureVision® lenses work continuously to maintian your eyes' natural moisture level. As a result, PureVision lenses stay moist and your eyes stay refreshed all day. PureVision contact lenses lets you enjoy long lasting comfort. PureVision contact lenses are made with thin, rounded edges for a great fit. Their carefully-crafted contours help to ensure long-lasting, reliable comfort. Discover the convenience of a 30-day lens. PureVision can be used daily, or replaced every thirty days. Remembering to replace your lenses couldn't be easier - just start with a fresh pair each month! *What is AerGel™? AerGel is a unique silicone hydrogel material, AerGel is specifically designed to allow a natural flow of oxygen to reach your eyes. AerGel also offers remarkable elasticity and, with the help of Performa surface process, actually resists dirt and debris, two comon causes of discomfor and irritation.